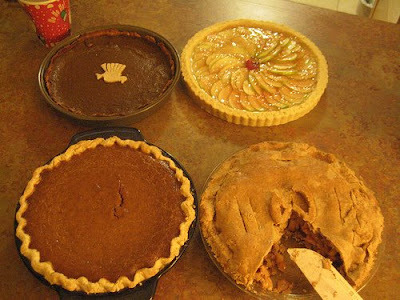 I made the first two, a vegan pumpkin pie and apple pie, both repeats from the Obama party. My brother cut out this amazing turkey - wow! This made a very hardy crust that would be amazing with a savory pie. 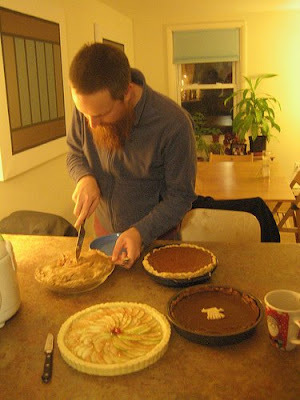 After a delicious gluten-free vegan Thanksgiving dinner (it was really good), we went over to Meghan and Gahlord's house, and then the two of them, plus JT and Rachel, came back over to our house for pie. 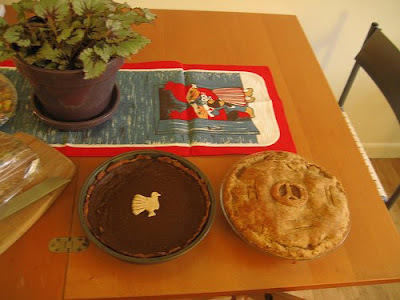 Greg made maple whip to go with these beautiful pies that Meghan made. The first is an apple-quince tart with sour cream - very original and rich with an amazing shortbread-like crust. The second is a Japanese squash pie that was as creamy as cheese cake and perfectly baked. Emily so good to see you in the 101.
that is the address for the GRE support. Congrats to being on the other side. I have one month and I am trying to keep it cool. my wife locked down a lights out Key Lime Pie for Turkey day with some heavy cream. We forgot to take pics. She is less the exhibitionsit. ooooh send me that recipe! i'll be posting about an avocado pie pretty soon...it's been described as a key lime pie inside a thai restaurant.